My grandparents had several hummingbird feeders, and I remember as a child watching them with awe. They were always there, and grandma was always re-filling the "juice". After my grandfather passed away, I got one of those feeders, and I've been trying my best to bring the hummers to our house! We live in a new development, and so there aren't many trees (though we're working on landscaping our yard, especially with hummingbird attracting plants). I was getting discouraged...it's been a couple of months. But, this week....we have a regular visitor! (the pictures are a little blurry, taken through our kitchen window, and then zoomed in). I went with a different style feeder (easier to clean, and with a perch around the edge), and it finally worked! We've been enjoying watching this little guy land, eat, and then return. I never knew they actually sat still, but read that they actually use so much energy hovering that the prefer to eat while perched. 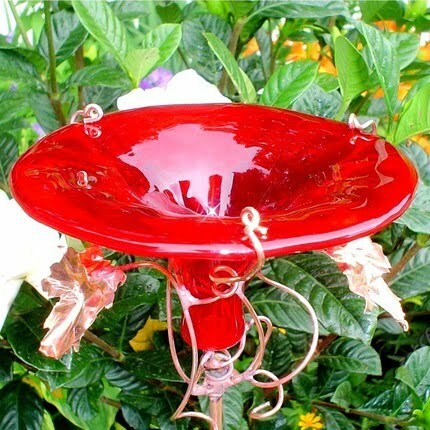 I also have this feeder from Glorious Glass Garden on Etsy, which they hover around but haven't visited - I need to fill it with something other than water. Next on my list is to get another little one, like this. Let's get some more birdies to our bare backyard! Check out this lovely fall themed treasury, created by a fellow EcoEtsy team member. It features my latest listing, a recycled lambswool diaper cover. I'm tickled to have been included with these beauties, thank you LindaEve! Click image above to explore the treasury items in Etsy! Congratulations to Susan who won her choice of Eco-Fleece soaker from The Review Stew (This is a size small in charcoal)! Thanks for playing, and enjoy! To get your own Eco-Fleece soaker (made from 89% recycled pop bottles), visit my Etsy or Hyena Cart shops. Looking for an interesting way to wrap a birthday gift? Or need a few extra reusable bags to stash in the glove box? Find an old tank top, and in a few minutes your problem is solved! With just a few stitches from a sewing machine, you can do it! 3. Fluff open the bag at the seam you just made, adjust the fabric so the new seam is in the middle of the fabric, and sew a perpendicular line to your new seam. This creates a gusset (square bottom). You can omit this step for a flat bag. 5. Turn the bag right side out. Voila! You did it! You can tie the "handles" together, or use a fancy ribbon. Maybe decorate with fabric paint, or even an iron on transfer for a one of a kind gift!